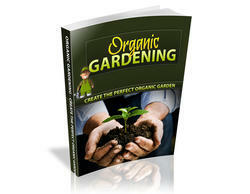 Much less attention has been paid to the weathering (oxidation) of organic matter than to its burial. This is a shame because both processes equally affect the level of atmospheric CO2 and O2. Recently, experimental evidence has been presented that shows that the oxidation of coal (as a representative of sedimentary organic matter) in water results in the formation of oxygen-containing organic compounds before complete oxidation to CO2 (Chang and Berner, 1999). The kinetics of the coal-oxygen reaction deduced by Chang and Berner have been applied recently to a model for global organic matter oxidation (Lasaga and Ohmoto, 2002). However, the Lasaga and Ohmoto model overly simplifies organic weathering in that it does not take into consideration several complicating factors: (1) Organic matter in sedimentary rocks (kerogen) is dispersed in shales with complicated geometries, including adsorption within clay minerals (Hedges and Keil, 1995). Lasaga and Ohmoto treat organics as grains of coal as in the Chang experiments. 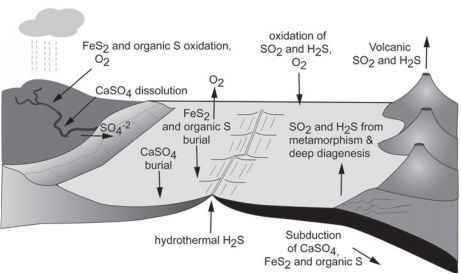 (2) Oxygen enters shales by diffusion down concentration gradients, both in air and in interstitial solution, not by being in a uniformly well-mixed "soil" with atmospheric O2 composition that was assumed by Lasaga and Ohmoto. (3) Kerogen oxidation in shales is mediated and probably accelerated by bacteria (Petsch et al., 2001). Thus, use of the Chang oxidation rates by Lasaga and Ohmoto, which were obtained via abiotic experiments, may be incorrect. of this recycled, old organic matter has been demonstrated by studies of modern sediments (e.g., Eglinton et al., 1997; Blair et al., 2003), and it complicates modeling of the long-term carbon cycle. A theoretical model for organic matter weathering in shales is being constructed (Bolton et al., unpublished ms) that incorporates erosion, organic matter oxidation, O2 diffusion, shale porosity and permeability, organic matter and shale texture, pyrite oxidation (most organic-rich marine shales contain abundant pyrite), and measured gradients of organic C and pyrite S. The fundamental question being addressed is whether the rate of oxidative weathering of both organic matter and pyrite is controlled by O2 transport into the shale or by the exposure of the organic matter and pyrite to the atmosphere by erosion. 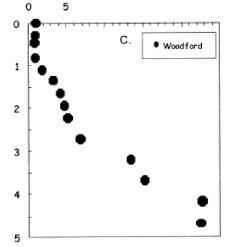 If the former is true, then the rate of weathering becomes a function of the level of O2 in the atmosphere. It has been assumed by some authors (e.g., Holland, 1978; Berner, 2001) that organic weathering is independent of atmospheric O2 and dependent only on uplift and erosion. Preliminary results of the modeling suggest that this is correct, but further work is needed. With regard to the factors affecting the oxidative weathering of organic matter, all of those that affect silicate weathering, as discussed in chapter 2, need to be, at least, considered. Certainly uplift and erosion is important in exposing organic matter to the atmosphere. Bacterial respiration is strongly temperature dependent, and if organic matter oxidation is mainly bacterially mediated, feedback factors based on temperature change need to be considered. Runoff, as affected by continental drift, should be included if organic weathering is not limited only by uplift and erosion. More flushing of the organic matter by O2-containing water should lead to faster weathering. The remaining weathering-impacting processes—the effect of plants and lithology—probably play lesser roles in organic oxidation. Thus, in modeling the long-term carbon cycle, an expression for organic matter weathering rate needs to include the modifying parameters fR(t) for erosion (equation 2.1 or 2.5), fAD(t) for runoff (equation 2.27), and fBt(t) for temperature as it relates to CO2, solar evolution, and land temperature (equation 2.29). Finally, it remains uncertain whether the O2 level of the atmosphere should be also included in a weathering rate expression for organic matter, as done by Lasaga and Ohmoto (2002). A final decision awaits the results of better models for organic matter weathering and more field measurements on shales. How does organic matter cause weathering?